A national expert on immigration law, University of Houston Law Center Professor Michael A. Olivas has just released his 13th book, No Undocumented Child Left Behind, which examines the 30-year history of the U.S. Supreme Court case Plyer v. Doe. In 1982, the landmark ruling made it possible for undocumented children to enroll in Texas public schools and has been frequently contested at both the state and local level. 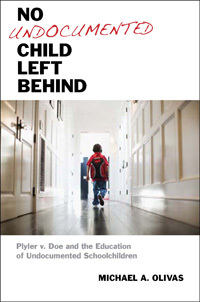 In No Undocumented Child Left Behind, which is part of the Citizenship and Migration in the Americas Series published by NYU Press, Olivas evaluates how Plyler v. Doe continues to suffer from implementation issues and requires additional litigation and vigilance to enforce the ruling. He also examines the ongoing debates over the Development, Relief, and Education for Minors (DREAM) Act, which aims to provide conditional citizenship to undocumented college students who graduated from U.S. high schools and have been in the country for at least five years. The William B. Bates Distinguished Chair of Law and Director of the Institute of Higher Education Law & Governance at the UH Law Center, Olivas answers some questions on immigrant rights, Alabama’s recent immigration law, and No Undocumented Child Left Behind. Q: What was your motivation to write No Undocumented Child Left Behind? The 25th and the 30th anniversaries of Plyler v. Doe had come and gone, and come again, with no single authored full length book on the case-- one tried in Houston and decided the year I came to UH (1982). I had interest in seeing how the case had held up, and the more I dug, the more I was drawn to its narrative arc: sojourner, innocent children brought to a new country where their families lived in the shadows. It is very compelling, and the decision was the best our country has to offer—compassion, a fierce belief in reducing inequality, and political and personal courage. Q: What do you hope to accomplish with the publication of this book? To draw attention to the important issues of incorporation, the strains in the U.S. polity, and the breathtaking and unrelenting meanness of the restrictionists who are still fighting this, 30+ years later. Q: Does Alabama’s recent immigration law violate the 1982 Supreme Court decision in Plyler v. Doe? Yes, as applied, but they all knew that. They just wanted to put the fear of God (and La Migra) into the hearts of the parents, who were lured by other Alabamans to come there and do the backbreaking work that none of us do, and have not done since the state’s crops were rotting in the fields. That ad terrorem tactic worked. Q: Is there a better way to handle illegal immigration? This way does not handle it—it violates federal law and overreacts, and has drawn US Citizens into violations of the law; it has also shown the interconnectedness and globalization of migrant and farm labor in a way no other means could have. Only federal comprehensive immigration reform can work—we cannot have 50 state immigration policies, any more than we can have 50 foreign policies or forms of currency. Q: What hot button issues will be in 2012 and beyond concerning immigrant rights? Employer sanctions, deferred action for college students, the loosening of the restrictions on family members, the DREAM Act at the federal and state levels, and comprehensive immigration reform. The Republicans have cruelly shut off any possibilities and tried to turn the clock back, but the internal pressures are unrelenting. When the grownups take over in both parties, we will have the needed reforms, as we did with President Reagan in 1986. Texas in particular has a great deal invested here, inasmuch as its border with Mexico is the longest and most contested. Note how Gov. Perry’s immigrant tuition policies, which I helped write, ran afoul of the hot breath of restrictionists.